Q. What is SciVal? How do I access it? How do I access SciVal? 1. Search for SciVal under the Databases tab. 2. 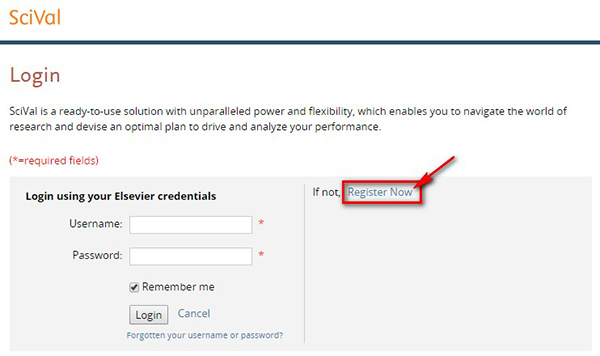 At the Login page, click on Register Now to sign up for a personal SciVal account. Note: If you have previously created a personal account for Scopus, then you do not need to create another account. Just use your Scopus login credentials. 3. A system-generated email will be sent to you and you will be required to verify your account information. 4. Once your registration is successful, you will be logged in to SciVal. From here, you will be able to access Scopus and SciVal seamlessly via the resource tabs at the top right corner. 5. 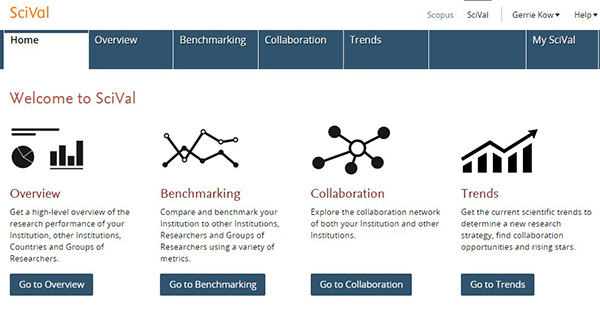 Alternatively, if you are already in Scopus, simply click on the Menu icon at the top right corner to open up a list of options and click on SciVal to proceed to the resource. If you are not logged in at that point, you will be prompted to login or create an account (see point 2). Chrome and FireFox are the recommended browsers for accessing SciVal. If you do have to use Internet Explorer, please ensure that your compatibility mode is turned off. More details on this can be found here.